NAPA, Calif. -- The Atlas Fire, the largest of the wildfires burning in the North Bay, is now 68 percent contained and has burned 51,064 acres. While the danger from the deadliest, most destructive cluster of blazes in California history was far from over, the smoky skies started to clear in some places. 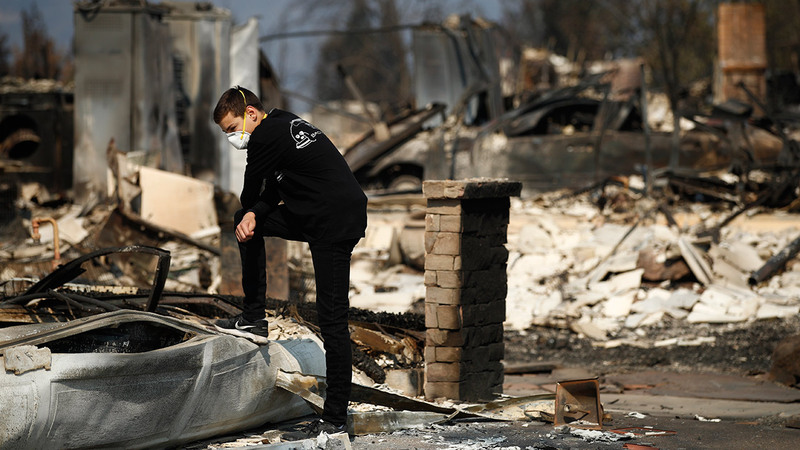 People were being allowed to go back home in areas no longer in harm's way, and the number of those under evacuation orders was down to 75,000 from nearly 100,000 the day before. "This is my home I'm going to come back without question," said Howard Lasker, 56, who returned Sunday with his daughter to view their torched house in Santa Rosa. "I have to rebuild. I want to rebuild." The blazes were blamed for at least 40 deaths and destroyed some 5,700 homes and other structures. The death toll could climb as searchers dig through the ruins for people listed as missing. Hundreds were unaccounted for, though authorities said many of them are probably safe but haven't let anyone know. In hard-hit Sonoma County, Sheriff Rob Giordano said authorities have located 1,560 of the more than 1,700 once listed as missing. Many of those names were put on the list after people called from out of state to say they couldn't reach a friend or relative. Many evacuees grew increasingly impatient to go home - or at least find out whether their homes were spared. Others were reluctant to go back or to look for another place to live. "Every day we keep hearing sirens at night, alarms," Hernandez said. "We're scared. When you see the fire close to your house, you're scared." "I'm not saving lives," he said. "I'm just here to make somebody's day feel better, make them feel normal." She and her husband, William Krier, 89, were anxious to get home, but after being evacuated for a second time in a week Saturday, they didn't want to risk having to leave again. "We're cautious," she said. "We want to be safe." Daniels, 74, a wine importer and exporter, said he lost everything left behind, including his wife's jewelry and 3,000 bottles of wine in his cellar. "It's heartbreaking," the 74-year-old said. "This was going to be our last house. I guess we've got one more move. But we're fortunate. We got away. Most things can be replaced. The bank didn't burn down."